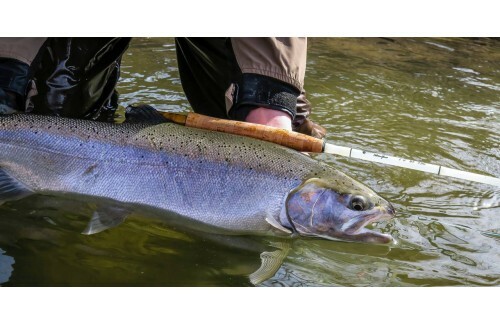 Fiberglass fly rod is so popular in American these day. Fiberglass(Fiber Reinforced Plastics) also called GFRP, it’s a kind of Compound material.Fiberglass are composed of reinforced fibers and matrix so we designed this fiberglass fly rod. Due to the compete Characteristic, fiberglass fly rod has light weight and high strength.The density is between 1.5 and 2.0, only 1/4 to 1/5 of carbon fiber. But the tensile strength is close to carbon fiber materials.This fiberglass rod is flexible than other fly fishing rods. So it is popular in fly fishing fields. Fiberglass 7ft 3wt 3pcs rod tested by Maxcatch fly fishing angler. Maxcatch has 4 colors fiberglass fly fishing rod right now on the market. Unic purple fiberglass with brown tube,translucent white fiberglass with green tube,orange fiberglass with Orange tube and blue fiberglass with blue tube. The fiberglass fly rod gives you the highest quality and design for your fishing needs. Our elegant design may look delicate, but it's extremely durable and resistant to breaking! Fiberglass rod builts in three sections, this rod is easy and safe to take on the go with the included rod tube!